John Cairns was the son of Thomas and Phoebe Cairns, of Ballygawley, Co. Tyrone. John was born on 12th May 1891 in Errigal, Ballygawley. John’s father Thomas had been a Gunner in the Mid Ulster Artillery. He was educated at the local National School. John worked as a labourer. The family lived in Ballygawley town. John Cairns enlisted in Ballygawley in 1909, and was called up on mobilisation in August 1914. 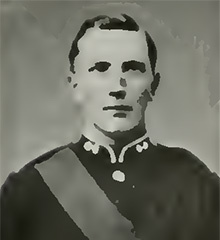 Sergeant John Cairns was serving with the 2nd Battalion of the Royal Inniskilling Fusiliers when he was killed in action on 31st October 1914 at the Battle of Messines in France. He was 23 years old.